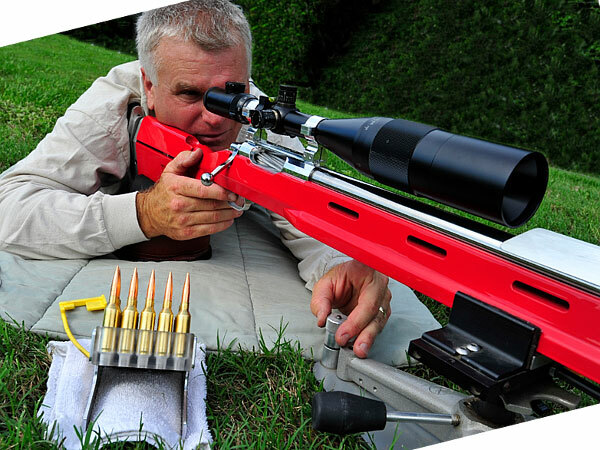 The beautifully-made Pistol Dynamics (PD) Products Cartridge Caddy has become popular with many top shooters. USA F-Class Shooting Team members Shiraz Balolia, Kenny Adams and others rely on these caddies to access ammo and keep time. 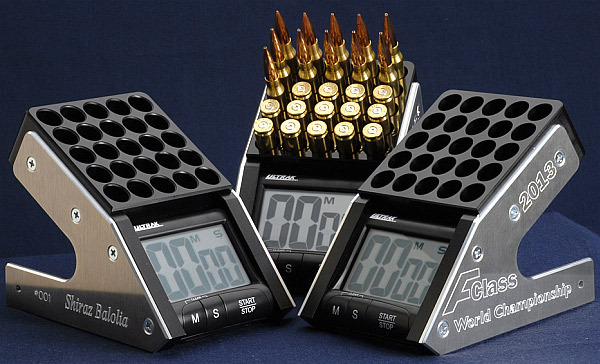 By providing a clear, unmistakable visual display of time remaining and rounds fired, these ammo caddies make life easier for shooter, scorer, and coach. To celebrate the 2013 F-Class World Championship in Raton, New Mexico this month, PD Products, through its Formula-F Division, has introduced a limited run of sequentially-numbered World Championship Caddies with F-Class World Championship graphics and optional name engraving. Production of these 25-round caddies will be limited by the number of units sold to participants of the match and will cease after that point. Caddies are available for a variety of cartridge types from .223 Rem to 7mm Magnum. Some Caddies are multi-caliber capable. For example, the .308 block accepts .308 Win, .243 Win, 7mm08, and other .308 family variants. Limited-edition ‘World Shoot Caddies’ cost $140.00 (shipping included) with optional name engraving for $20.00 extra (at time of purchase). PD Products’ original On-Time Caddy is still available for $110.00, including standard shipping within the continental USA. Custom name engraving is also available on this product. Both the original PD Products Caddy and the special Limited Edition World Championship Caddy come with a lifetime warranty on machined parts and one year on the timer. PD Products website, call (321) 733-1266, or send email to: info [at] pistoldynamics.com . 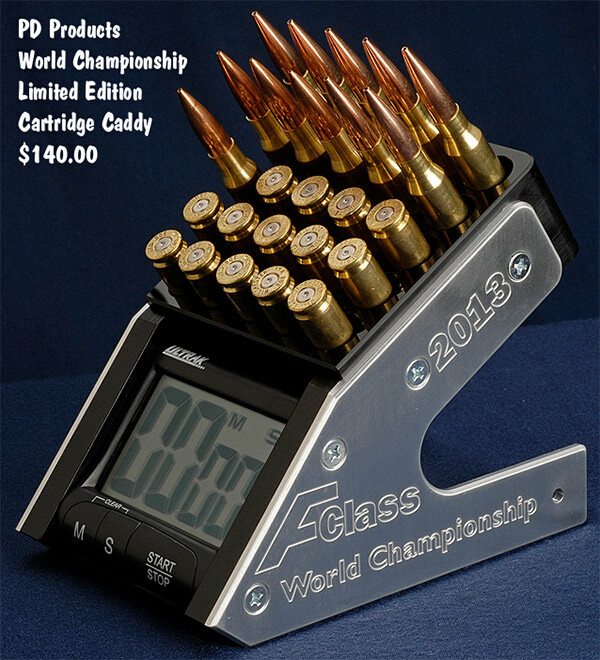 Share the post "‘World Championship’ Cartridge Caddies from Pistol Dynamics"